Francis Cargeeg was born in Hayle in 1893. His Father was employed at Harvey’s Foundry as an Engine Driver. Instead of following in his father’s footsteps, Cargeeg served his apprenticeship with Holman's of Camborne who had become world leaders in the production of drilling equipment used in the mining industry. He finished his apprenticeship in 1914 and signed up with the Edward Hain Shipping Company of St. Ives, serving as a 4th Engineer on the ss Trevalgan. He then worked in H.M. Dockyard, Devonport, in engineering maintenance until the early 1930s when he moved back to Hayle with his wife Winnie to pursue his dream of being a full time coppersmith. However, with the onset of World War II, Cargeeg found himself working for Associated Octel who were in the business of extracting bromine from seawater, which was then used to improve the efficiency of advanced aero engines. After the war he went to work for J & F Pool of Hayle, an engineering firm who produced perforated sheet metal. In the late 1940s Cargeeg was at last able to work full time as a Coppersmith. He and Winnie had moved in with his sister Holly at her cottage ‘Trevean’ on Mellanear Road. From a small workshop he used traditional tools and methods, not dissimilar to those used by his Celtic ancestors, to produce a wide range of decorative items. 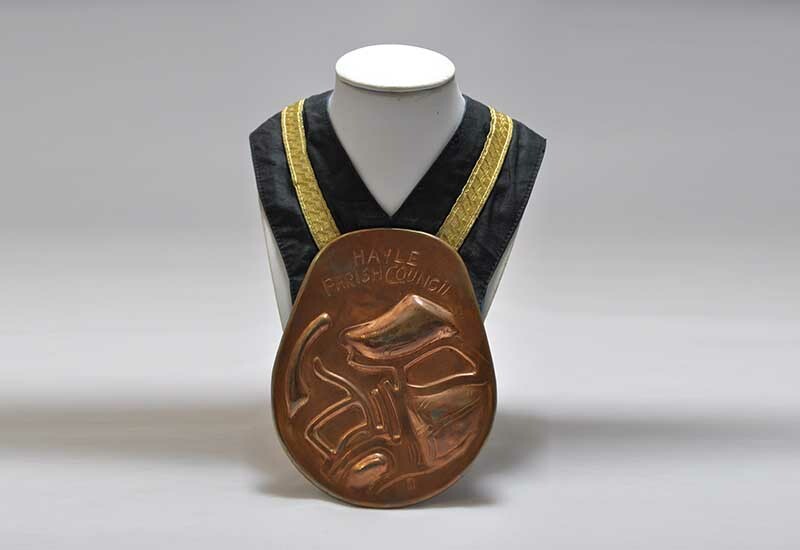 He was commissioned to produce Regalia for Hayle Town Council and the Cornish Gorsedh. He was a member of the Gorsedh himself, promoting the language, history and culture of the Cornish. Much of his work was sold at the former Grigg’s Forge Pottery in Lelant, although his output was limited; many items took more than a year to produce and he desired to create a “small range of styles and sizes in order that I can master my art”. All of his work reflects his deep love of Cornwall, its mythology and its symbolism.